Since I've just gone on a bunch in my previous post about how good cucumbers are for you, just enjoy this pickle recipe! Bread and butter pickles are a personal favorite of mine so that is what I tried out. This is a quick pickle recipe so they need to be refrigerated. If you are experienced in canning you can certainly store this batch that way. Enjoy on anything and everything! In a medium bowl, combine the cucumbers, onion and salt. Mix well. Cover the mixture with ice. Let stand at room temperature for two hours. In a pot, bring sugar, vinegar and spices to a boil. Drain cucumbers and onions. Add to vinegar mixture and bring almost back to a boil. Remove from heat and cool. You can store the pickles in an airtight container for up to three weeks in the fridge. They will begin tasting pickled in just a couple hours. We're having a GREAT beet season. So naturally, that means we've been eating lots of beets. Adding them with other seasonal veggies is the best way to get the freshest flavors all in one delicious dish. Not to mention, they're fast and easy! Beets and fresh herbs simmering in the dutch oven. In a large Dutch oven or pot, heat oil over medium heat. Add onion. Season with salt; cook, stirring occasionally, until softened, 5 to 7 minutes. Add beets, broth, and enough water (4 to 5 cups) to cover. 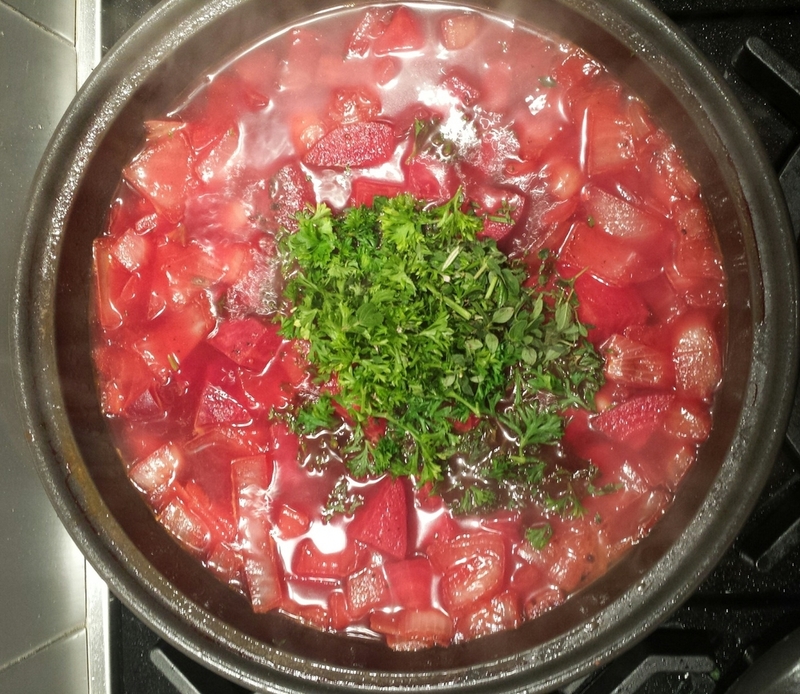 Bring to a boil; reduce heat to medium, and simmer until beets are tender, about 20 minutes. Using a blender or an immersion blender, puree broth and vegetables until smooth. If using a blender, work in batches and fill only halfway, allowing heat to escape: Remove cap from hole in lid, cover lid firmly with a dish towel, and blend. Transfer to a clean pot as you work. Adjust soup's consistency with a little water if necessary. Season with salt, pepper, and lemon juice. Clean and cut the beets into large chunks. Coat the beets with olive oil, salt and pepper. spread them out on a baking sheet (pref. made of clay) and bake in the oven at 375 tossing every 5 minutes in the oven until nice the beets are soft and slightly charred. Remove from oven and set aside. Cut the tomatoes and oranges into large chunks and chiffonade the herbs. Toss them all in bowl and when the beets are cooled down a bit, add them as well. Drizzle with olive oil and season with Himalayan salt and pepper. Serve over a bed of arugula and enjoy on its own! This year in tomatoes....was late, by about a month. We usually get our big bountiful harvest at the end of August but with the wacky summer weather, we are still unloading tomatoes by the basket full at the beginning of Oct! Its safe to say that I have successfully added tomatoes to just about every dish, salads and juices alike, dehydrated, them, froze some and noone makes marinara like my mom so I don't even touch that one. I'm starting to feel like the Bubba Gump of tomatoes! So to help speed up the tomato eating speed, I decided to make a warming and comforting tomato soup...big success! Of course this helped to put a dent in the pile and fill some bellies as well. Be sure to use farm fresh tomatoes no doubt this soup will make you smile. Wash, core and cut the tomatoes into halves. Spread the tomatoes, garlic cloves and onions onto a baking tray. Drizzle with ¼ cup of olive oil and season with salt and pepper. Roast for 30-35 minutes, or until caramelized. Remove roasted tomatoes, garlic and onion from the oven and transfer along with any roasting juices into a large stock pot. Add 3 cups of the vegetable stock and bring to a boil. Reduce heat and simmer for 20 minutes or until liquid has reduced by a third. Add thai basil and cilantro. Garnish in bowl with chopped fresh thai basil or cilantro. Raw Crackers made from Juicer pulp! I always wanted to try and reuse all the pulp that was left behind after juicing -to feel less wasteful. Well after experimenting with a raw diet a few months back, I looked up a recipe that would help me curb my cravings for bread/wraps and came across raw crackers...made with juice pulp!!! 2 problems solved with one solution! I have been in heaven ever since. These crackers are delicious served with hummus, homemade pesto, or slices of avocado (my favorite) and can also be used as a wrap if cut into bigger pieces before dehydrating. You save some BIG MONEY making this at home as well - these can cost a pretty penny in any food specialty store. First - select your veggies to juice with. What you choose to drink will affect how your crackers turn out. I like to stick to sweeter veggies and fruits but have also added kale and herbs (all delicious). I used carrots, apples, oranges, lemons, celery and ginger. Sort through your pulp and remove any seeds or undesirable pieces. Add 1 cup of flaxmeal flour or chia bran (I used a combination of both) and desired spices. I use himalayan sea salt, white pepper, cayenne, cumin and tumeric). Be generous with your seasonings as they really help flavor the cracker. Incorporate 1 cup of water and mix all together. Put mixed ingredients in the food processor in small batches and process until consistency is fine. (There can be some small chunks - it won't make a huge difference). Spread out on cookie sheet or Teflon sheet and spread evenly. You most likely can get about 2 trays worth out of these. Score the sheet with your knife into small squares - this will help alot later in separating them. Dehydrate in your dehydrator or oven (mine has a setting) for about 8 hours. About 4 hours in flip over so the other side has a chance to get evenly dehydrated. (I dont know if you need to do this if you have a dehydrator, but in my oven I found this works wonderfully). After they are done, you should be able to pull them apart pretty easily. Store them in a plastic bag in your fridge and enjoy!